This recipe has been successful for many folks per multiple online postings, but it was a complete disaster for me. All was fine (I followed all instructions) until I blind baked the dough, when half of the pie slumped into the middle of the pie plate. I had rolled it, crimped it and left it in the refrigerator overnight so it should have been cold enough-I generally use Pyrex so will not freeze and put a crust into a hot oven (though I will with tart crusts). Would love to hear from anyone else who has used this recipe-at least one other Epicurious user had the same problem that I did. My guess is that the butter and cream cheese combo may cause some issues- apparently many people have some shrinkage with this crust (though RLB says this one is supposed to hold the shape well). I would attempt this again but with a double crust pie only. I used this recipe as it was suggested for the Cherry Lattice Pie. I think it was fine--didn't really have any glaring shrinkage issues, and the crust was fairly easy to roll out. I can't really say that it made a difference in the pie--I would have enjoyed it just as much if I had used Martha Stewart's Pate Brisee recipe (my go to) instead. Just looking at the proportions of flour to butter to water, I think Trisha is correct about the cause for shrinkage. I compared this recipe to the one that I routinely use (Martha Stewart's basic pie crust) and find that Rose's recipe falls short on the proportions for a crust that is light, flakey, and tender. I believe a pie crust recipe needs to stay simple because the focus should be on the filling. So I think I will stick with Martha's recipe, which never shrinks, is easy to work with, and has a buttery, flakey taste. This is really an excellent pie filling, but you need to have some time because it is a multi-step process. You macerate the apples for a couple of hours and then strain off the accumulated juice. You cook down the juice with some butter to make a thick syrup and then add back to the apples. The pie sets up beautifully and has a wonderful apple flavor. I used four types of apples that I got at the farmer's market--- Northern Spy, Bramley (first time I've seen them in U.S.), Stayman, and another variety. Absolutely delicious. This is an excellent apple pie, but this takes some time. Like her All American Apple Pie, you macerate the apples first. You then take the accumulated juice and boil it down with some butter to make a syrup that is mixed in with the apples. The crumb topping has walnuts in it and it forms just a thin topping. I would have liked just a bit more streusel on top, but it was still very good. My family was a definite fan of this pie. The extra step of creating a caramel from the apple juices is pretty genius and makes the dish. See my notes for the streusel topping (you may want more) and the cream cheese pie crust (I had big problems with it) in this book before attempting those sub-recipes. I was able to purchase some sour cherries at the Santa Fe farmers market this past summer, so I hauled them home and, of course, made a pie. This was a great recipe to highlight those cherries--I will have to try to get to Santa Fe in the early summer more often! Unlike most pies, this one was light (only one crust) with a lovely fresh flavor. It slices surprisingly neatly, considering there isn't much to hold the berries together. The crust was quite tender. I made cutouts with the pie crust scraps, which I baked and placed on top of the pie for decoration. We enjoyed the pie both plain and with whipped cream. This recipe was rated very well when it was published in the Washington Post. See that lising for hints about bakng it. I made this pie back in 2004 for a Slow Food honey-tasting event. It is definitely showy (bubble wrap is used to create the honeycomb design in the chiffon), and its looks might just outshine its taste. Regardless, it was a fun pie to make and present. I used marzipan to make the bees (with melted chocolate stripes and eyes) instead of the ganache. There was only so much effort I was willing to put into this pie! Excellent version of shoofly pie. A sweet cookie crust filled with lime curd lightened with whipped cream and topped with fresh kiwi and blueberries, it doesn't get much easier than this. Delicious, and quite beautiful! Worst pie disaster I've ever had. Must be operator error. Can't believe a RLB recipe could turn out so badly. I used whole wheat pastry flour for the crust. As the dough refused to come together, I added a tad more water and refrigerated overnight. The cranberry were macerated in granulated sugar overnight as well. I saw no cracks in my formed galette, however all the juices leaked out during baking, getting under the silicone mat, making a hard sticky mess. As a result, the pie was extremely dry. Have to eat it with loads of whipped cream or vanilla ice cream. Life-changing. Unbelievably tasty. I used her cream-cheese crust and made it into one 9 1/2 inch pie (serving was a bit tricky, but it tasted fine) instead of 4 individual pies. The filling is unbelievably tasty. I used button mushrooms but I can't wait to try this again with morels (my favorite), which is what she recommends. No more difficult to make than regular pie crust, the dough comes together quickly and becomes easier to work with with each consecutive fold and turn. I used a reliable brand of regular Canadian butter - not the recommended higher fat, european-style - with stellar results. The pastry was excellent (quick puff, page 420), crisp, flaky, beautifully puffed up, but the flavour was somewhat underwhelming with cheese flavour lacking. The hot Hungarian paprika I used helped, but next time I'll double or even triple the cheese. My first attempt at making this laminated dough met with great success thanks to the author's meticulous instructions and additional tips. The danishes were light, flaky and tender and unlike anything I'd eaten before. Made initially just to challenge myself - and to reduce my baking "bucket list" by one item - I suspect this will be repeated in future...so many shapes and filling combinations to try! My go-to, never-fail recipe for choux pastry that always produces hollow puffs with dry interiors. I use the food processor mixing method which is very quick and easy. This is a perfectly serviceable streusel topping for pies, but the amounts for a 9 inch pie are a tad stringy. I wasn't able to fully cover the pie with the amount of streusel it made. This sauce is orgasmic. Use the microwave ( oil a glass measuring cup four time as big as you need, it will boil up) and people will be lined up to take this home, while you'll be licking your fingers. You do need the Cuisinart power strainer, do use both the fresh lemon and the Chambord. do make a double recipe so you can be generous and still have leftovers. Kindle version on sale at $3.95 during November 2017. 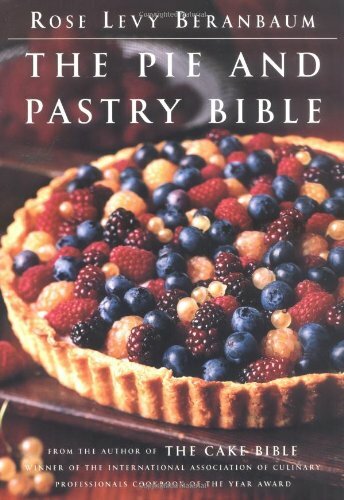 Easy-to-follow recipes for fruit pies, chiffon pies, custard pies, ice cream pies, meringue pies, chocolate pies, tarts and tartlets, turnovers, dumplings, biscuits, scones, crostadas, galettes, strudel, fillo, puff pastry, croissants (chocolate, too), Danish, brioche, sticky buns, cream puffs and profiteroles. All kinds of fillings, glazes, toppings and sauces, including pastry cream, frangipane, Chiboust, fruit curds, ice creams, fondant, fruit preserves, streusel, meringues, ganache, caramel and hot fudge. Pointers for Success follow the recipes, guaranteeing perfect results every time.